Definitions and examples of Bladder Ultrasounds are presented in two views. An ultrasound of the bladder uses high frequency sound waves to create a live image from inside of a patient’s body. It is a painless test that is used in the medical field today. An ultrasound is also sometimes referred to as a sonogram, diagnostic sonography, or ultrasonography. The medical professional that performs an ultrasound is called a sonographer. It is recommended to take a transabdominal pelvic ultrasound of the bladder and pelvis when the bladder is full as it provides a "window" for seeing deep into the pelvis. It is recommended to take a transvaginal pelvic ultrasound of the bladder and pelvis when the bladder is empty, as the results help physicians see an entirely different view. 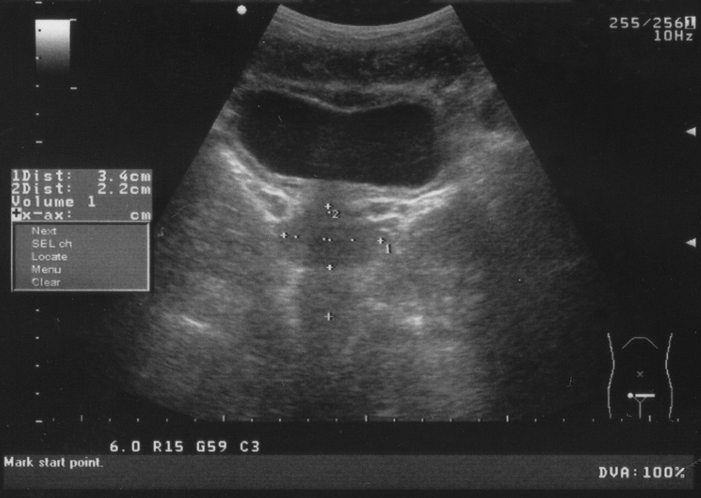 An ultrasound of the bladder is often done along with an ultrasound of the kidneys. A bladder ultrasound can be used to guide doctors or surgeons during a procedure, such as a biopsy. They are important in planning for certain types of therapy and surgery, as well as in the aftermath to determine whether the patient’s body is responding to treatment. A bladder ultrasound is used in urology, a branch of medicine that focuses on the surgical and medical diseases of the male and female urinary tract and the male reproductive organs. An ultrasound of the bladder is used to check how much urine remains in a patient's bladder after urinating. A bladder ultrasound can show any obvious abnormalities of the bladder, the size of the bladder, the thickness of the bladder walls, and the presence of blockages or stones. Above: Bladder ultrasounds, like the one shown here, are done for a variety of reasons.